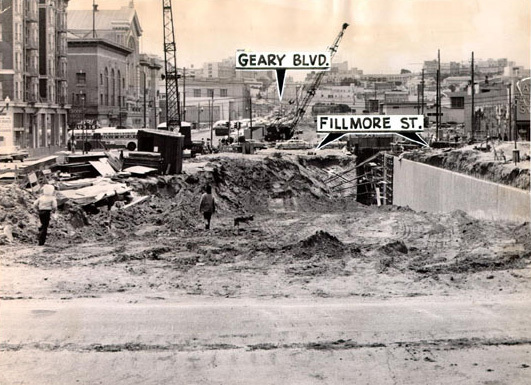 Construction underway on the new and expanded Geary Boulevard in 1960. We didn’t know it at the time, but our building was a weird precursor to the Summer of Love. In 1965, that stretch of Pine Street had been a pre-Haight hippie scene, with half a dozen houses filled with longhairs and dealers. The downstairs unit had been home to the legendary hippie newspaper the Oracle. Across the street, at 2111 Pine, a rooming house once stood; some of the itinerant musicians there played in a vanished after-hours jazz club three blocks away called Bop City.